ST. GEORGE – Delegates heading to northern Utah for the state GOP’s reorganizing convention will get to consider if the party should support the use of medical cannabis. However, the resolution also states there is already “ample evidence” that medical cannabis is an effective alternative in relation to alleviating chronic pain and seizures brought on by certain medical and neurological conditions. Medical cannabis has also been touted by supporters as a viable alternative to opioid-based medications. According to Fox 13 News, some of the sponsors of the resolution are known to be involved in trying to get state lawmakers to legalize medical cannabis. 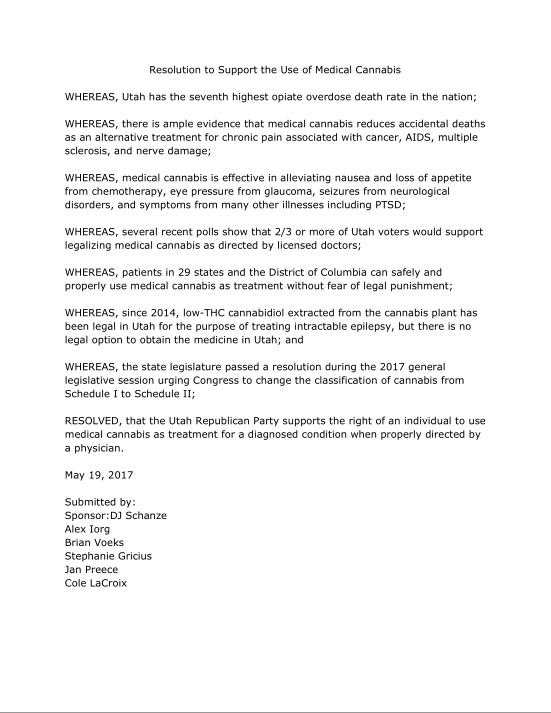 With the exception of a cannabis oil extract used to treat epilepsy (and has to be obtained in states where it is legal to sell), use of cannabis for medicinal purposes remains illegal in Utah. Previous attempts have been made in the Legislature to legalize medical marijuana, but thus far those efforts have come up short. To this end a group called Together for Responsible Use and Cannabis Education, or TRUCE, has begun an initiative to get the legalization of medical marijuana question on the 2018 ballot. Leaders of the group have said that Utah lawmakers have dragged their feet too long, so now it’s time to let the voters decide. The Utah Republican Party’s reorganizing convention will be held May 20 at the South Towne Exposition Center in Sandy. DO IT! NO MORE PILLS! NO MORE OPIOIDS! Maybe they will one day legalize it for recreational use, so maybe we will have less of the Methhead element running around. Rather have Potheads than Methheads! Potheads are to lazy to steal my line set off of my AC condenser unit! GO FALCONS! never heard of that. what is there, maybe 5-10 bucks in scrap metal for condenser lines? They steal the copper wiring and pipes – it was a rampant issue in AR where meth is prolific. Apparently, copper is worth a bit of money. Utah’s opiates problem is a glaring concern. Utah lawmakers need to push their religious biases aside, and offer other, safer solutions to long term pain management than opioids. Part of me thinks that common sense has prevailed. That they’ve finally grasped what we’ve all known for years. A cheaper and safer alternative to over-prescribed drugs. Then I wonder if they’re doing it purely to shore up support for their dreadful governance at the national level… The jury is out, Great Success, I’ll judge them on their actions rather than their words. Considering​ how moronic the state is with alcoholic beverages, it’s hard to believe that anyone is seriously believing that there is any possibility of marijuana legalization, no matter what it is used for, or how it is sold. It is really difficult to believe that these hypocrites are actually turning their backs on this, as a source of tax revenue! we need an LDS church cannabis dispensary. we could it right in the temple visitor center. *we could put it right in the temple visitor center. It would certainly ease the pain of their rhetoric!